The Padirac Chasm or Gouffre de Padirac is a cave located near Gramat, in the Lot département, in France. The chasm itself is approximately 99 m (325 ft) around its rim with a diameter of approximately 35 metres (115 ft). Visitors descend 75 m via a lift or a staircase before entering the cave system. The cave, at a depth of 103 metres (338 ft), contains a subterranean river system that is partly negotiable by boat. This cave system is regarded as "one of the most extraordinary natural phenomena of the Massif Central". The chasm was created at an undetermined point in time when the roof collapsed into a large internal cavern. It is known that the cavern existed in the 3rd century, and was inhabited during the 15th and 16th centuries during which time Potassium nitrate was excavated from the area. 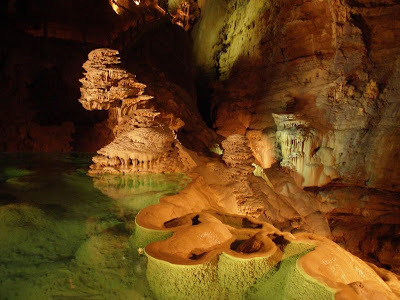 The first tourists visited the cave on November 1, 1898, however the site was officially opened for tourism on April 10, 1899 by Georges Leygues, the 87th prime minister of France (then called président du conseil). Today, although the cave system is made up of more than 40 km (25 mi) of galleries, only 2 km have been opened for tourism. Since the 1930s, visitors can access the underground cave system by descending 75 m by lift or stairs, and then exploring the cave system on foot and by boat. Padirac holds the record for the most frequently visited underground tourism facility in France. More than 350,000 visitors annually, and a record of 460,000 in 1991.